(Note: Click on the image for a larger view. I also describe this machine in a YouTube video). The original Macintosh might have been cute and novel, but its 128k memory and single disk drive made it a pain in the arse to use. Swapping disks (and twiddling thumbs) was the norm and frankly, it was just too underpowered for businesses to take seriously. Adding 512k of RAM (done with the next iteration) was an improvement but even with an external floppy drive the machine chugged along at a pedestrian pace. That fancy GUI needed a lot of memory and (in the absence of memory) lots of (slow!) floppy disk read/writes. 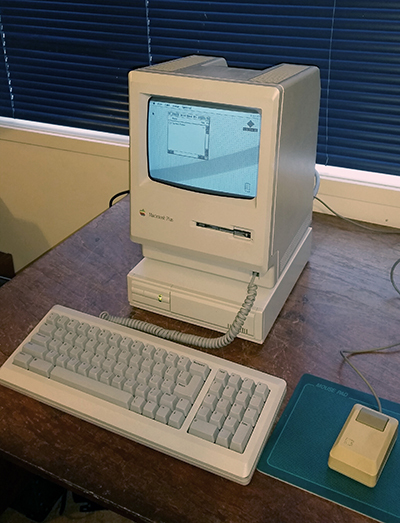 With the release of the Macintosh Plus in 1986, the line finally developed into a machine worth crowing about. The disk drive capacity was doubled from 400 to 800k, memory was boosted to 1MB and a numeric keypad added to the keyboard. The most significant development in my book though, was the addition of a SCSI bus. This allowed external hard drives, like the one pictured under the Mac Plus opposite, to be easily accommodated. With a fast 20+MB of storage online, the Mac Plus became a productivity powerhouse, particularly for creative writing and desktop publishing where it clearly stood head and shoulders above the IBM AT and AT-clone kludges at the time. Macs would occupy this niche for years to come. I got this little beauty, along with the SCSI drive, in a school loft rescue. Apart from the mouse, there is no yellowing and (at first) it worked just fine. An issue developed however due to dry solder joints on the vertical video board (a common problem). This was rectified and the machine is now AOK. Another valued item in the collection, showing the evolution of the Mac from toy to really useful item!